Purifiers - Drive and Friction Clutch Arrangement. The purifier bowl is mounted upon the vertical shaft. 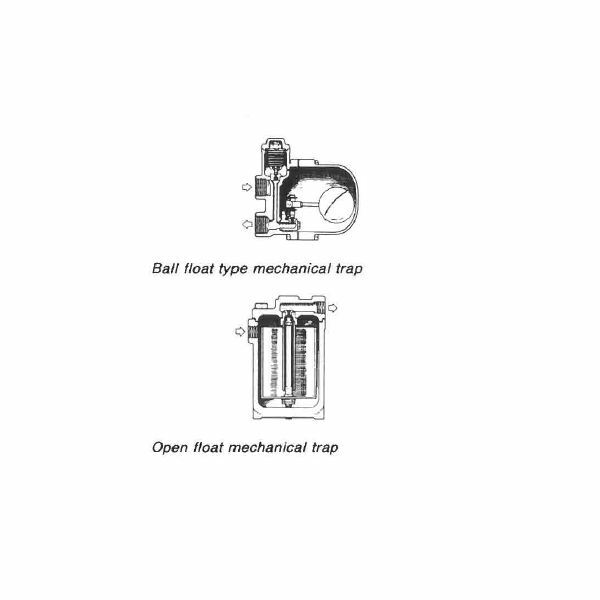 The most important point is that the bowl is driven on a keyless taper secured by a lock nut on the vertical shaft. The vertical shaft is supported on the upper part by a bearing with six springs located in the radial direction that function to take up vibration in the horizontal direction. The lower end of the vertical shaft is supported by a ball bearing to take up the vertical thrust. The ball bearing on the lower end is usually of a double row angular contact type. Between the upper bearing and the lower bearing, a worm gear is located on the vertical shaft. This worm gear is exactly in mesh with the worm wheel on the horizontal shaft. The horizontal shaft is supported on both the ends by simple ball bearings just to support and allow rotation. One end of the horizontal shaft has the friction block, which also acts as a brake drum. Other end may be a free or may have an attached feed pump. The purifier bowl and its associated bowl parts are really heavy when assembled together. Thus the inertia is huge enough that the machine cannot be started in the same manner like other pumps or blowers. 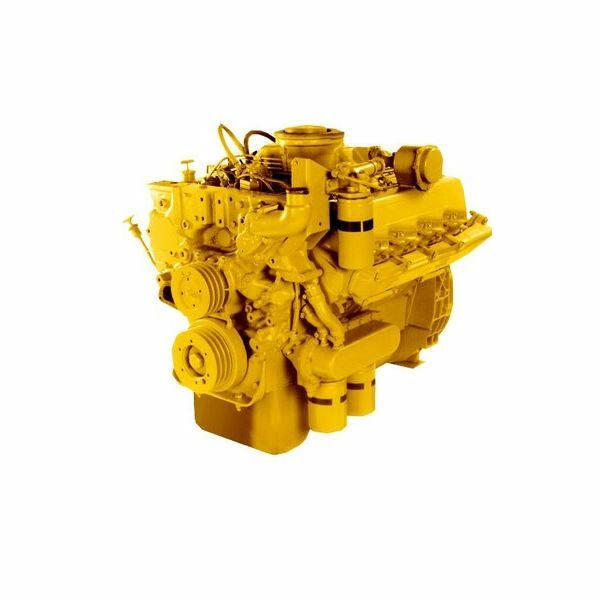 If such heavy machinery is started with direct coupling, the motor will trip on overload or may cause severe damage to the worm gear arrangement due to sudden load on the gears. 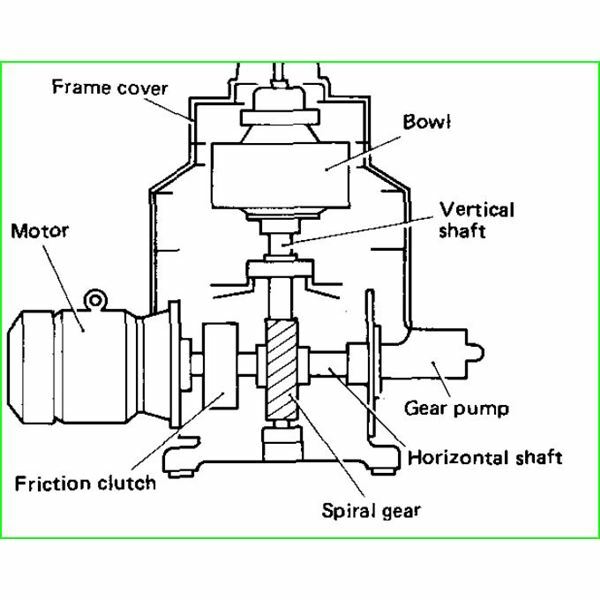 In order to avoid such disaster, a friction clutch is mounted on the horizontal shaft. The motor shaft has two or more friction pads mounted on it, which is contained within the friction drum. 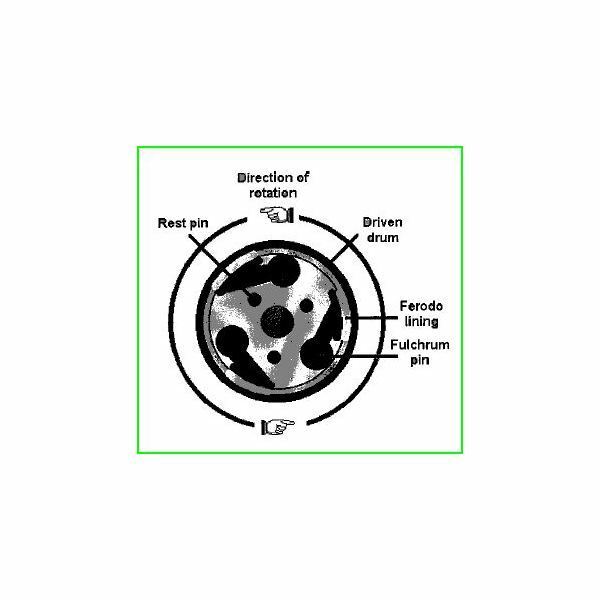 Thus as the motor starts, the friction pads move out due to centrifugal force, thus causing a friction on the internal surface of the friction drum. This friction starts to drive the horizontal shaft, gradually increasing its speed. As the motor speed reaches maximum, the centrifugal force on the pads reach a maximum value, creating maximum friction which gradually brings the horizontal shaft to the rated speed. Thus the motor does not get overloaded and the high inertia machine is brought to rated speed gradually without any damage. The friction block is circular in shape having a provision to accommodate the friction pads within it. Thus the motor shaft having the friction pads on it fits inside the friction block. These friction pads have a curved surface and may vary from 2 to 6 in number with each having a special Ferodo lining. These pads, when rotating along with the motor shaft, fall out and touch the inner surface of the friction drum. It actually does slip when rotating so that a gradual acceleration of the horizontal shaft is achieved. Apart from the main function of driving the bowl (by friction and slipping), it also acts as a safety device. If there is any mechanical obstruction on the bowl or on the drive assembly, the clutch will slip preventing very severe damage. Since the purifier bowl assembly has very high inertia, it takes some time to stop. 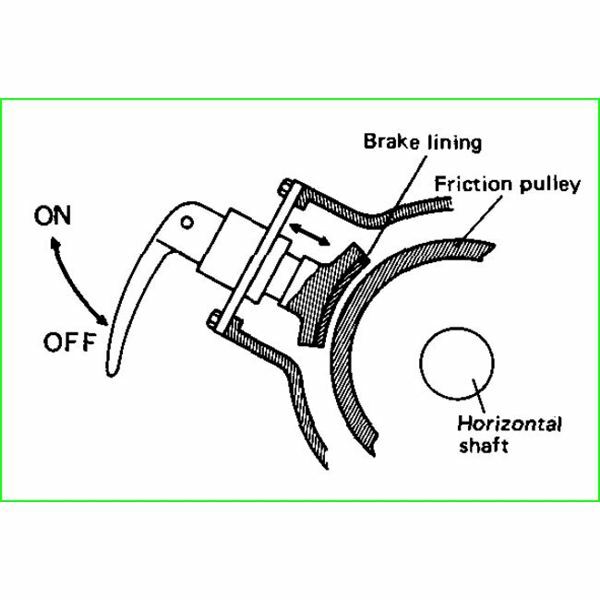 To stop the purifier immediately, there is a brake assembly provided, which when engaged rubs against the outer surface of the friction block. Take care not to start the purifier with its brake on. The worm gear wheel on the horizontal shaft is fitted with a shear pin. The main function of the pin is to shear off when any mechanical seizure occurs on the transmission system. 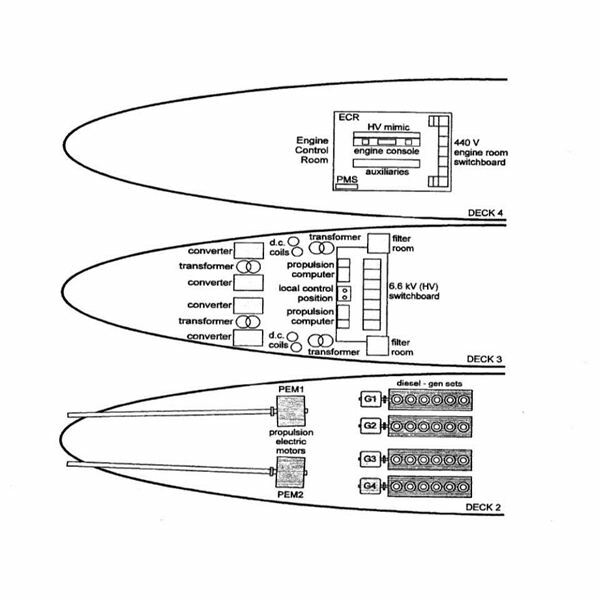 An important point to be noted is that the shear pin is tapered and not a straight one. There is a matching taper on the horizontal shaft and the worm wheel sleeve. Thus this ensures that the pin won’t fall out due to its high rotational speed. The starting current of an induction motor is six to eight times the full load current. When such a motor is used as a prime mover for these high inertia machines, some special arrangements are to be incorporated. The instant load on the electric motor at start-up is not as big as the separator is driven by the means of centrifugal clutch. At first, the motor attains the rated full speed, making the torque on the friction pads increase. This causes the bowl to gradually achieve its rated speed. Thus it is necessary to use a motor which can withstand the initial start-up overload. The current (amperes) during starting remains elevated till the bowl speed attains the rated value. 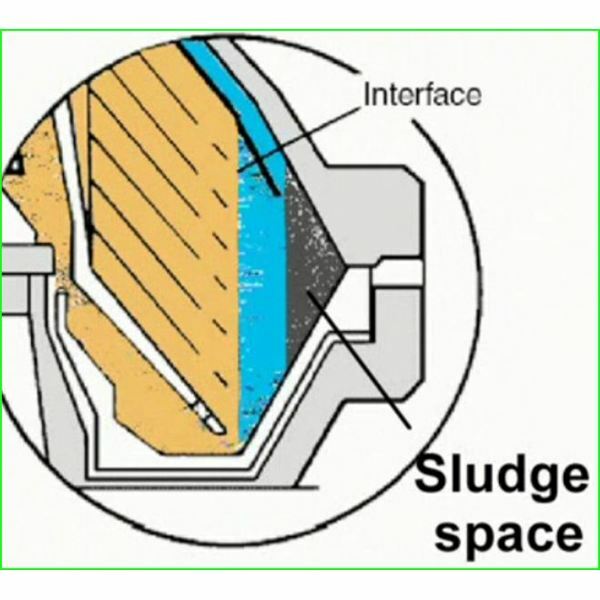 When the separator discharges sludge, the speed of the separator drops momentarily and the amperage goes up till the bowl attains the rated speed. 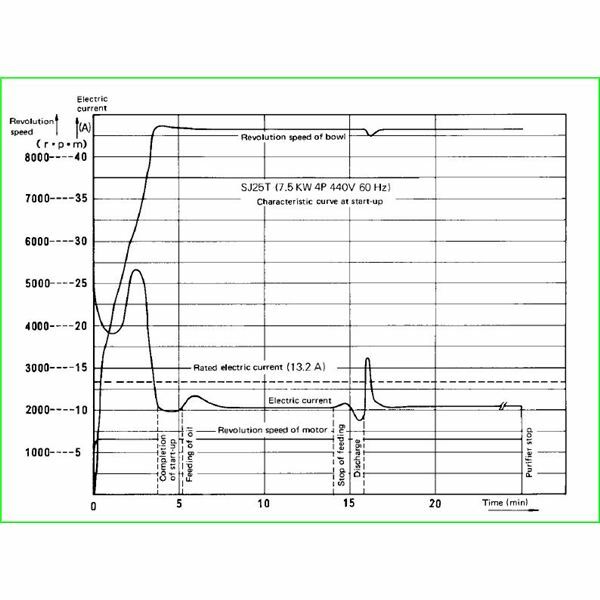 The amperage shows a slight increase during the discharge cycle, when sealing water is added to the bowl. 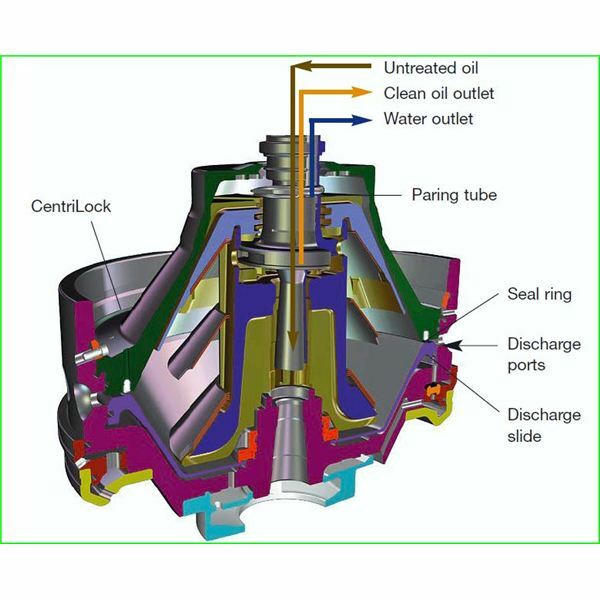 After sludge discharge, when the oil is fed into the bowl, the amperage slightly increases and reaches back normal value. The above points are evident from the graph which shows the current versus speed characteristics of the purifier and its prime mover. 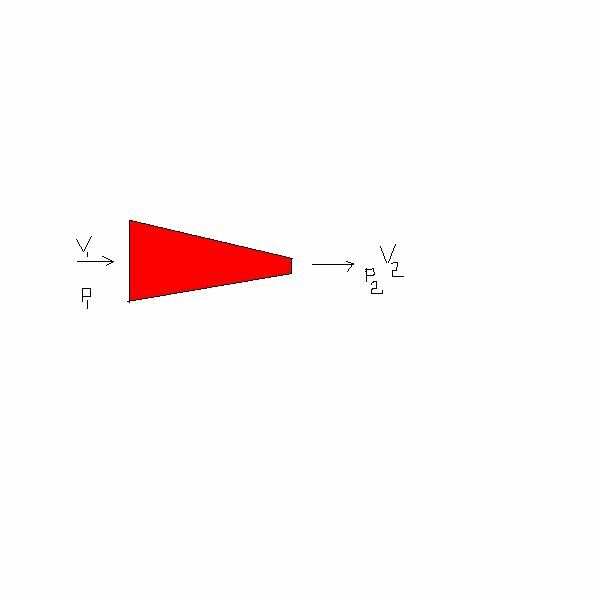 The reason for the increase in current during discharge cycle is not clear, however it is assumed that as the bowl separates into two different parts, there is a change in moment of inertia, which causes the mass of the rotating bowl to increase and thus increase in current. The motor starting circuit has a special arrangement for allowing the motor to consume high current only during starting. The circuit has a special timer, which keeps the overload circuit out of action for the initial starting period. Once the timer has reached its limit, the main circuit takes over the control with its overload protection. The starter circuit remains isolated till the next starting sequence. The usual timer setting is for 10 minutes and it can be varied depending upon the type of purifier. 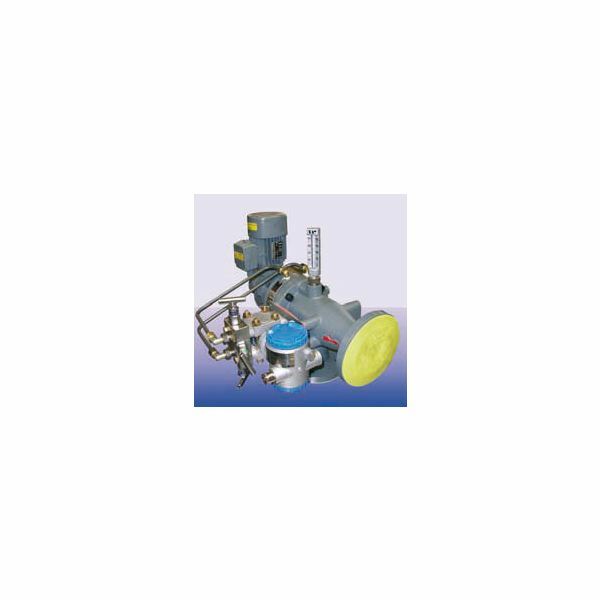 The main operating principle is separation of two liquids with different specific gravities. The dirty fuel or lube oil is fed into the purifier bowl. The water and sludge particles with higher density move outward compared to the less dense oil. Thus with the help of the gravity disc, the clean oil and water interface is maintained. The clean oil is taken out of the bowl and pumped into the service tanks for consumption by the engine. The waste water and sludge get accumulated and are discharged into the sludge tank for disposal. When the oil is at room temperature and kept in a tank, it is difficult to separate oil and water. But as the temperature is increased, the settling of water takes place comparatively faster in the still tank. But in a purifier, the separation efficiency is improved eight times more by the action of centrifugal force and elevated temperature. However, the recent modern purifiers are capable of separating high density oils, care to be taken not to exceed 100 degrees as water will start boiling and thus the interface will not exist and thus causes oil overflow. Personal, and Alfa Laval website.